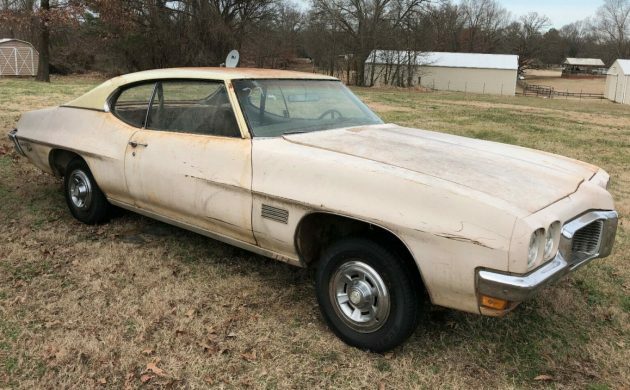 Like a half-eaten M&M, most of the candy shell is intact on this 1970 Pontiac LeMans Sport but there’s no meat. Not that they make meat-flavored M&Ms (hmm.. bacon M&Ms!). This blank slate is listed here on eBay with a current bid of $360 but the reserve isn’t met, of course. 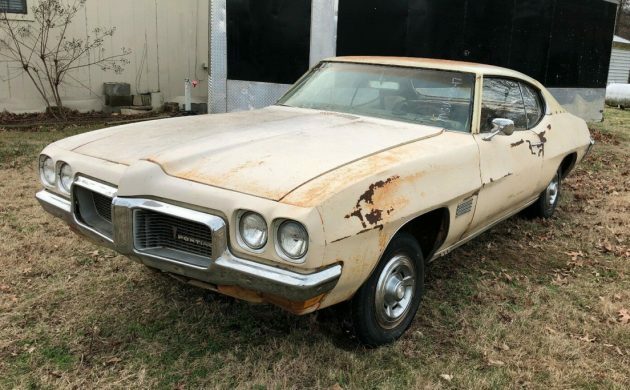 There is an $1,800 buy it now price, for a 1970 Pontiac LeMans Sport. Let that sink in for a second. It’s located in Mason, Tennessee, 45 minutes northeast of one of the great cities in the U.S. – Memphis. 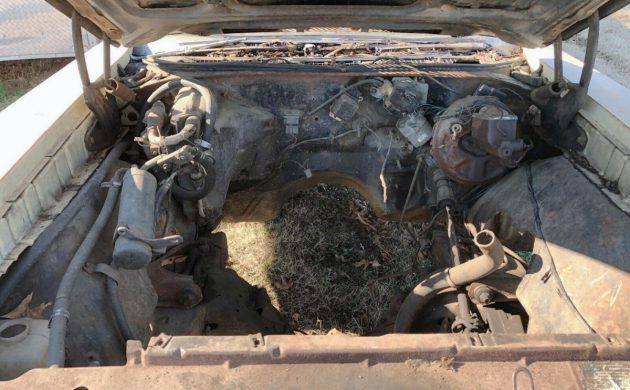 $1,800 for this car when it looks like a nice two-month project? You have undoubtedly noticed that it’s a bit higher in front. Yep, there’s no engine. Ok, but still, $1,800? 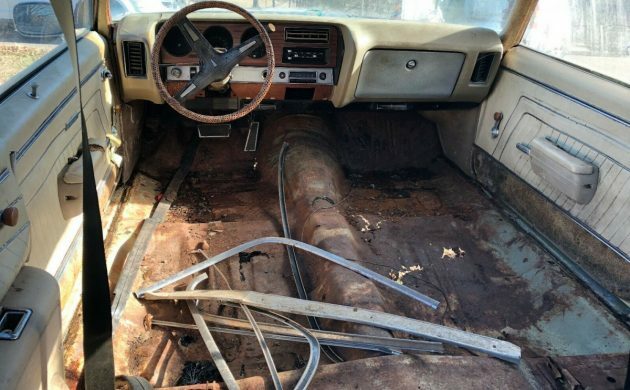 Hagerty puts a #4 fair condition value of $4,900 so once you get an “SBC” or whatever else is going in there, and a nice 4 or 5-speed (hey, a guy can dream) you’re going to be at that price if not more. Maybe that’s why nobody has hit the buy-it-now button yet. There’s more work to do here. The rear glass is gone and the windshield is cracked, “thanks to tow truck driver,” says the seller. 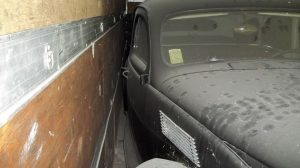 I’ve had damage from a shipper in the past. $1,000 in paintwork needed, but never broken glass. 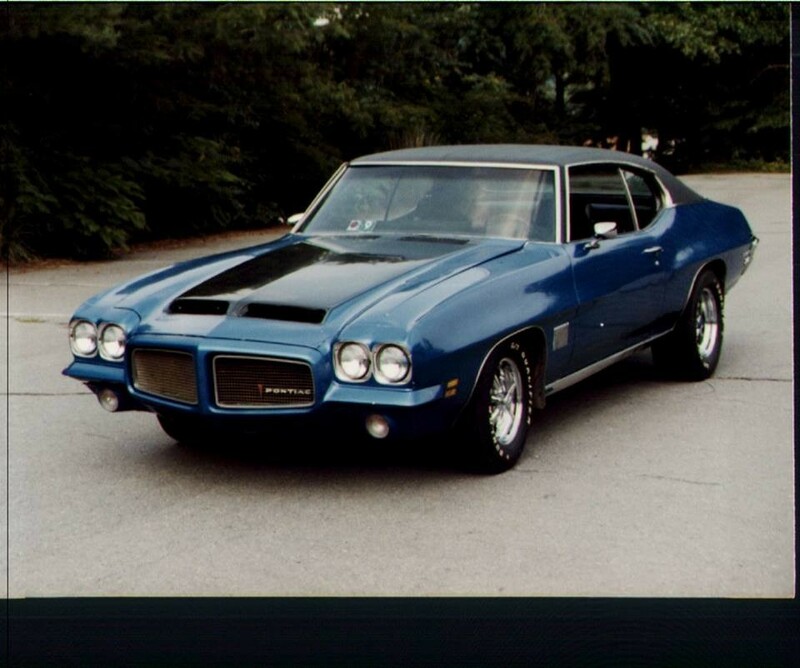 The LeMans Sport was the top model in 1970 in all body styles: the two-door hardtop, four-door sedan, and convertible. Umm.. so, once you add seats and floors to the selling price, and they’re available, you’ll probably be way over Hagerty’s #4 value. I’m not sure what happened with this car, why it got stripped down so much. One call to the seller, who sounds like a nice person, will tell the tale. It’ll take some work to get it looking like this again. So, was this the 350 or 400 V8? 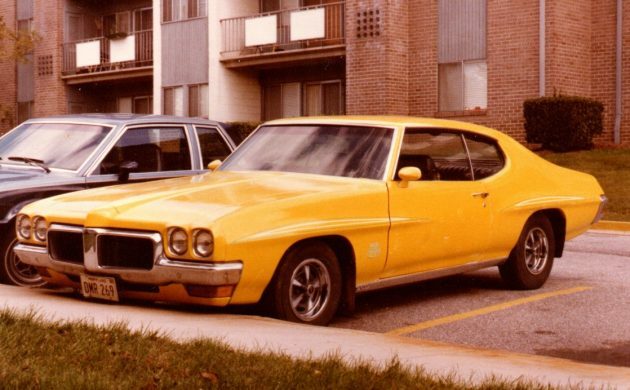 I believe that I’ve seen them with the 250-six but I’m just assuming that this car was a V8, I could be wrong. What would you put under the hood? 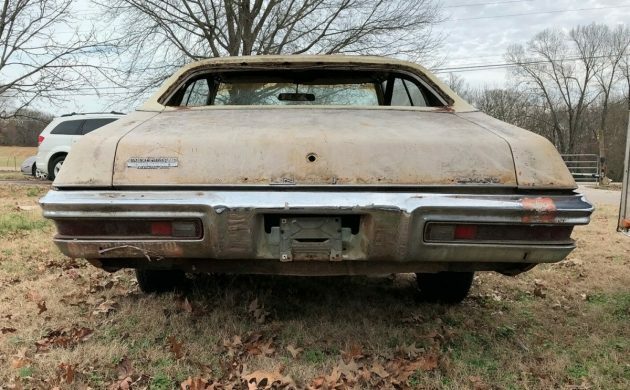 Is this LeMans Sport a worthy project given its current condition? The question is how much are the parts worth? 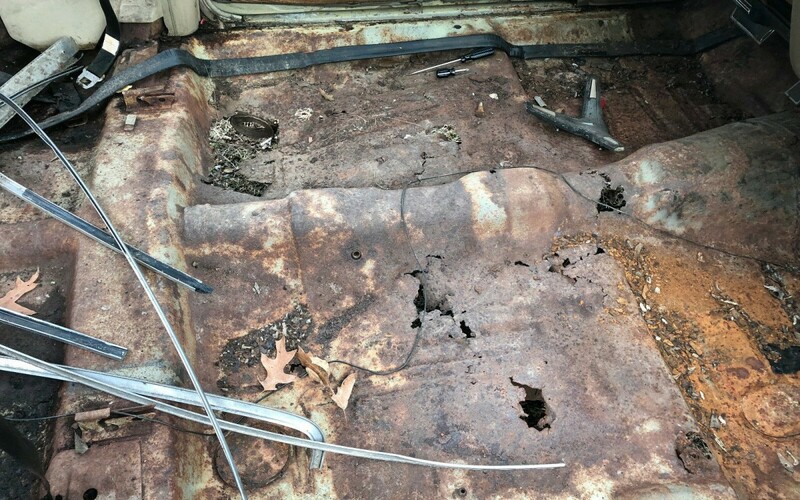 Vinyl top and no rear window equal rust alert! The price is fair if it’s not a rust bucket. Would make a fun LS powered sleeper! 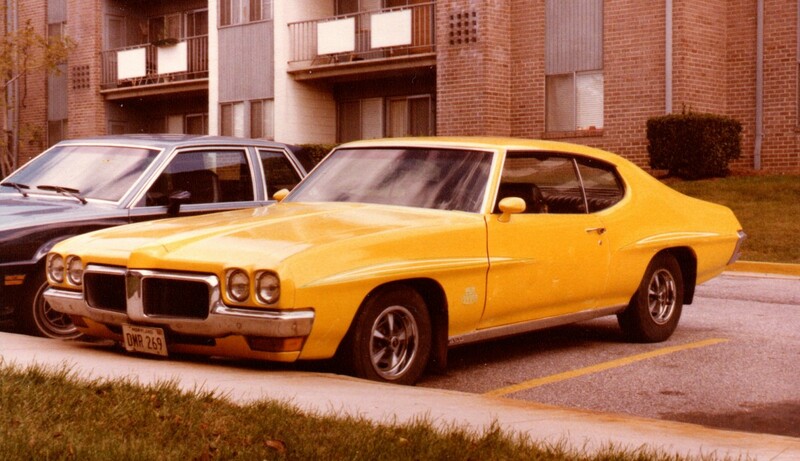 Had a 1970 LeMans Sport back in the early to mid 90’s. Just loved it. It was my first real classic, It was a very dark green, maybe hunter green. The body was pretty well loaded with bondo but it they did a fairly decent job on it. Interior was great and the engine was rebuilt at a GM shop by an employee who was rebuilding it on his break hour AT the shop. I think he was at truck and bus in Flint. 350 two bbl. Not a ton of power as he just put a hair over stock cam in it. I think it was called an RV cam back then. 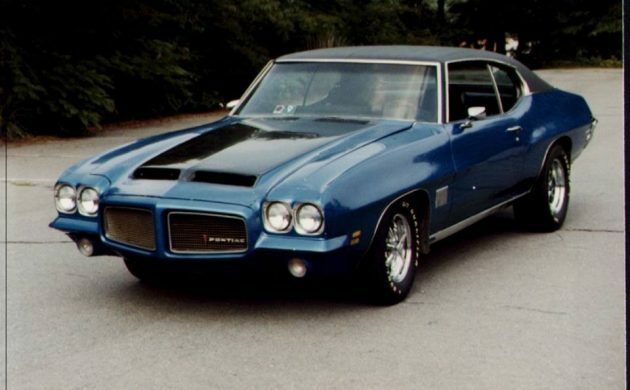 I really liked the car and it eventually got me hooked on Pontiacs. Reminds me of my old Big Yellow Bomber from years ago. Good memories! Listing ended. Sold. Good luck to the new owner. I think we all had that friend that hopped these up, trying to look like Goats. Here is my buddy’s from 1979-1981 timeframe.